Many thanks for your very kind invitation for Saturday, the 9th of December. Unfortunately. 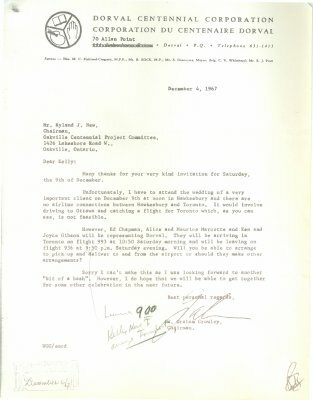 I have to attend the wedding of a very important client on December 9th at noon in Hawkesbury and there are no airline connections between Hawkesbury and Toronto. It would involve driving to Ottawa and catching a flight for Toronto which, as you can see, is not feasible. However, Ed Chapman, Alice and Maurice Marcotte and Ken and Joyce Gibson will be representing Dorval. They will be arriving in Toronto on flight 993 at 10:50 Saturday morning and will be leaving on flight 936 at 9:50 p.m. Saturday evening. Will you be able to arrange to pick up and deliver to and from the airport or should they make other arrangements? Sorry I can't make this as I was looking forward to another "bit of a bash". However, I do hope that we will be able to get together for some other celebration in the near future.